Our commitment has always been excellence in customer service and our growth has been promoted by professionalism in our jobs and customer satisfaction. 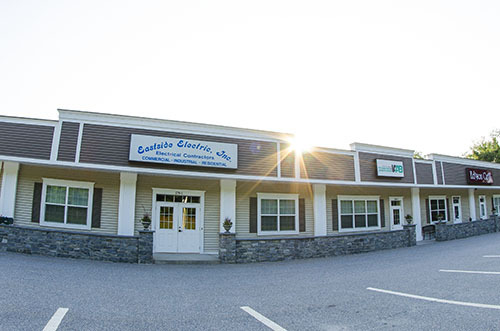 Eastside Electric, Inc. was established by Gregory L. Mele in 1987 and has grown to be a dynamic company employing dedicated staff and operating a fleet of trucks. Starting off primarily as a residential company, we have successfully expanded into the fields of commercial, industrial, and design work. Our professional office and expansive warehouse is located at 178 Birge Park Rd. in Harwinton, CT.
We have grown into a successful business, continuing in the pursuit of excellence in all aspects of our trade, striving for quality work and maintaining outstanding customer service. Being a full service electrical contractor allows us to accommodate a variety of needs. Every customer receives quality service for reasonable rates. Our trained staff of journeymen and registered apprentices are ready to be of service to you. Every project is seen to completion by our staff of qualified professionals. Field and office personnel work together to provide you with a smooth experience. Promptness, cleanliness and safety are qualities of our staff that we are extremely proud of. Eastside Electric Inc. has one of the lowest accident incident rates, which is the result of our attention to detail.Choose Eastside Electric, Inc. for Outstanding Customer Service for your projects. Whether a job is large or small, Eastside Electric, Inc. is the contractor to call. Eastside Electric has won the Register Citizen's best electrical company category for 2013, 2014, 2015 & 2016. © 2019 Eastside Electric Inc.